Dr. Kelly A. Turner is a researcher, lecturer, and consultant in the field of integrative oncology. Her specialized research focus is the Radical Remission of cancer, which is a remission that occurs either in the absence of conventional medicine or after conventional medicine has failed. Dr. Turner has a B.A. from Harvard University and a Ph.D. from the University of California, Berkeley. An important book for all cancer patients. Radical Remission is filled with hope, science and possibilities. Never before has anyone with Dr. Turner’s credentials dared to research the million dollar question: why do some patients get better from seemingly “incurable” illnesses? Dr. Turner has uncovered the holy grail those who want to optimize their chances for cure have been seeking. Bravo, Dr. Turner! This book is filled with important information for everyone, whether struggling with cancer or not. She is giving the world a gift at such an important time as so many are feeling like they can’t take their lives into their own hands. Kelly empowers us all to do exactly that. Kelly Turner delivers the message people addressing cancer -- or seeking to prevent it -- need to hear. Turner’s book gives you the support you need -- from science, tradition, and common sense -- to make powerful lifestyle changes that will tip the scales in your favor. 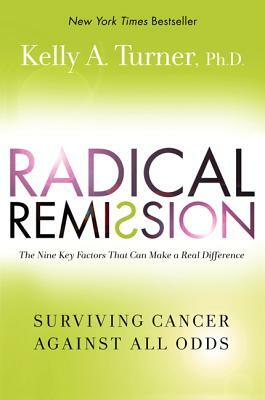 Radical Remission is a personal and deeply moving exploration of the power of the human spirit and innate wisdom of the body to overcome catastrophic illness. Persons with cancer and their families and friends will find it especially helpful. Kelly Turner is studying phenomena that is the very research and story sharing that will step us forward into solving the cancer plague. Kelly Turner writes as an accomplished scientist and as a compassionate human being to inspire us to question deeply the roots of our illnesses.